The Department of Public Works and Transportation, Office of Highway Maintenance is the coordinator of the “2018 FALL Clean Up Green Up” in which communities in Prince George’s County are asked to participate in the Countywide “Clean Up Green Up” event scheduled for Saturday, OCTOBER 20, 2018. The CSCA will be participating in the clean up event scheduled for October 20 from 8:00 a.m. to 10:00 a.m.
We are soliciting volunteers to participate in this collaborative effort to keep our Community clean. If you are interested in joining us for the Clean-up, please meet us on Saturday, October 20 at the Thrift Store parking lot located at 6307Allentown Road (Allentown and Old Branch Avenue) at 8:00 am at which time you will be assigned an area and receive supplies. The areas that are scheduled to be cleaned are: Old Branch Avenue from Allentown Road to Henderson Road; Allentown Road, from underpass on Allentown Road to Brinkley Road and Brinkley Road from Allentown Road to Temple Hills Road. Please note that you will be provided with a safety vest, litter grabber, trash bags and gloves. However, we are asking that you bring your own gloves because thin plastic gloves will be provided but for your safety it is recommended that you use garden or work gloves. Just a reminder that the safety vest and litter grabber will need to be return at the end of the clean up. We are asking for your support in keeping our community clean by showing up on Saturday, October 20, 2018 “Fall Clean Up Green Up” event. *Service Learning Hours are available for all students. 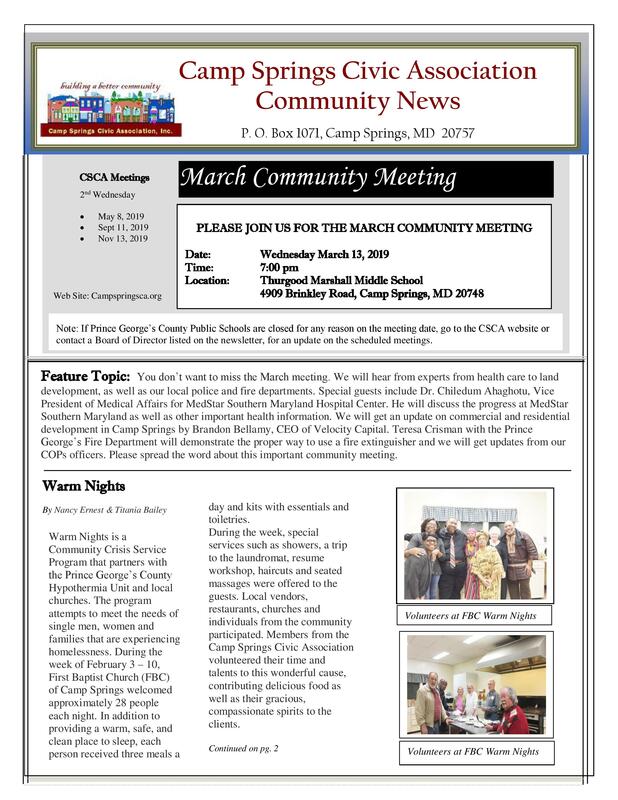 This entry was posted in Camp Springs, Local News, Prince George's County News, Youth News. Bookmark the permalink.